buynow/bloglater: River Island Skinny Jeans with pu trim! River Island Skinny Jeans with pu trim! "I quite like the look of River Island this season"
That's what I thought when I trolled the website. They have some nice monochromatic pieces that really speak to me through the computer screen - because we all know that happens - with strong blazers, interesting trousers and as always, lots of lovely shoes and boots. This lookbook has me all over it like a rash - link! I think the jeans I am wearing today are from the Autumn/Winter collection and cost £45ish. Of course the standout feature is the detail - a faux leather stripe down each leg and a trim on the waistband. It's a nice twist on an otherwise typically military look. Jeans: River Island (gifted) - couldn't find these on the River Island site but found them on ASOS - Link! Blouse: New Look - Link! I think I would quite like to wear these jeans with some big platform boots and a chunky black knit - I am seriously starting to miss the seasons. Whilst it's got cooler here it is not yet/ and probably never going to be cold. 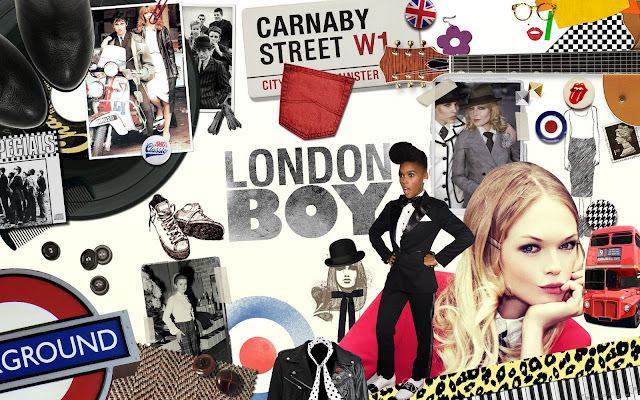 It is my duty to tell you that you can win these - and in fact all the items featured in the London Boy trend, to which these trousers belong - in River Island's Postcards in the Past promotion. a) I can't wear my hair straight - it looks so much better with a bit of a wave. However, this means I have to make some effort with my hair and that troubles me. Wavy hair is such a ball-ache when you are getting ready in the morning! ohhhh i just got some PU and jersey leggings i love these! I tend to not like river island much in the summer, but its always a winner in the winter with all the cardis and scarves! There's exactly one like that @ H & M! That blouse is amazing, my local New Look is so small its hard to find anything! I am in love with this whole outfit. I've been debating whether to buy that blouse for a while, but you've sold it to me! Ohh gorgeous jeans! I love PU atm, pleather & leatherette, on the look out for some key pieces, might invest in these, in trend but understated so you don't look like a biker wannabe haha! I really want a pair of these! I saw a similar pair with a faux leather stripe down the side in H&M, but the ones that fit my waist were too loose on my legs - and baggy leather just doesn't look good. I wish I'd bothered looking in River Island. Love the way you styled them, too! V. nice! Leather detailing seems to be all the rage this season, I like it here, it's more subtle! love love LOVE the jeans and that blouse is also amazing, river island and new look are rather good at the moment, in my opinion anyway! Absolutely LOVE these jeans on you! You look great as always. Argh just started reading that book..best friend gave it to me and said it was "scary"...bloody hope not as it has me fixated already! I really enjoyed S.J. Watson's Before I Go To Sleep as well! I can't believe he came up with it in his first "Writing a Novel" class! Your jeans are fabulous! I must get a pair haha. I'm also reading "Before I Go to Sleep" as well!! It's such an interesting book, I can't wait to finish it! leather trend is so in right now! @Computergirl - i can answer your question: NOT ONE BIT. They are seriously uncomfortable and I would not recommend them. yes they look good but work best when one is static - sort of pointless for bloody shoes! I am wearing mine to use them if you know what I mean but i read on Style by Kling that Prada's version (pink soles!) are much more comfortable! @DSK Steph and @Jen Umm - thank you so much! @Katie - I got it in store just a couple of weeks ago so they are bound to have it. fingers crossed for you! @Jessie - they seriously have lots of tops in there like that at the moment: look expensive but cost next to nothing! love it! @kokolaroo - thank you for the recommendation! will definitely Kindle that shizz! @BlushCrush - yes the website makes it look crap :) haha I think it's the blush and black - such a gorgeous colour combo! @Simply - I am really going to try and finish it tomorrow :) Love it! @ritas88 - you need these then :) leather trousers are but a dream for me...not entirely sure i would actually wear any but extremely unforgiving in any case! LOVING this outfit and those pants are killer!! You look soo chic! What did you think of RHOBH this week? Stunning as always, love your shoes!! You look perfect! I love these jeans, I was looking for something similar few days ago, I found in Zara. eep! hot outfit. love the black and the christian louboutin shoes! the blouse looks lovely. so is your hair most of the time straight? I thought you have wavy hair. i love how you look with wavy hair in your old vids when you used to wear a bit of extensions. I'd like to ask that you consider taking more full body shots - It's tough on the viewer to get the full picture when we can't fully see your shoes. I feel like handbags and shoes are items that we spend so much money on to finish off the outfit; in a way they are like the anchors that pull everything together. So please allow us the opportunity to appreciate your beautiful investments more! That blouse is SO beautiful! (as is the entire outift!) I just went on to the NL site to buy it and they only have site 8s left and are low in stock :( All of your lovely readers must have got in before me! Damn! Those jeans look absolutely amazing! Love the shirt! great outfit. Those jeans are absolutely fab! I love them! amazing jeans! loving your entire look. <3 YOUR BAG!!!! Silver hardwear looks great on black!